Bill’s Package Store wants you to know where it came from and how to make it. 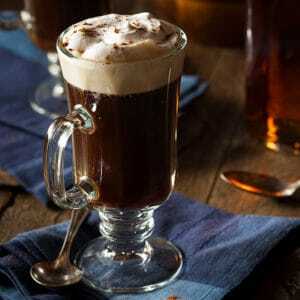 The original Irish coffee was created at the flying boat terminal in Foynes, Ireland. The short version of the story goes like this: On October 1943, a “flying boat” had departed from the terminal in Foynes but had to turn back due to bad weather. The restaurant staff was called back in to feed the passengers. The chef, Joe Sheridan, decided he was going to put some whiskey in the coffee to warm them up. A journalist from San Francisco, Stanton Delaplane, came through, tried the drink and went back and told his friend Jack Koeppler about the drink. Koeppler was the owner of the Buena Vista Cafe on Fisherman’s Wharf. He was intrigued by the drink and recreated it with Delaplane’s help. It is still served today at the Buena Vista Cafe. Preheat your glass with hot water, then pour that water out. Add a teaspoon of brown sugar and a shot of Irish Whiskey and stir together. Pour in hot coffee and stir again. Pour lightly whipped cream so it floats on top. Some variations have appeared over the years such as using Bailey’s Irish Cream, but the Buena Vista Cafe still serves about 2,000 glasses of the original recipe a day. And aren’t you lucky to have Bill’s Package Store nearby to pick up your favorite whiskeys or even some Bailey’s Irish Cream to enjoy today? Be sure to stock up for that special day coming up in March! Bill’s offers superior quality, top-shelf brands of your favorite liquors and wine at the lowest prices in Clarksville, TN. Call (931)647-5566 or visit at 1651 Fort Campbell Blvd Clarksville, TN 37042.
previous post: Champagne! What it really is. next post: Whiskey… the myths, the legends!